A little update on Feb was due I feel. 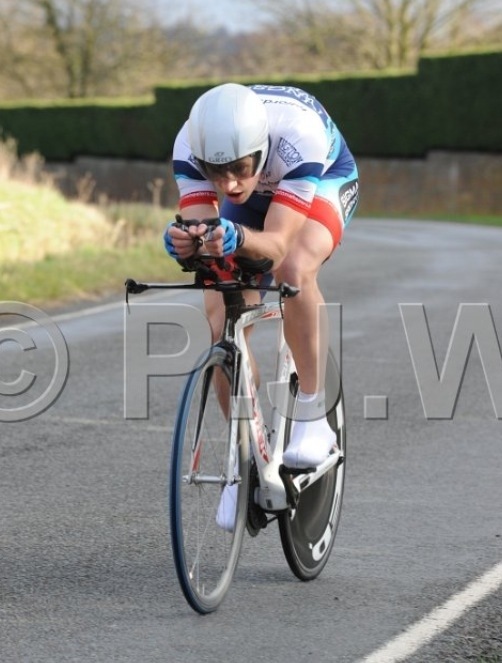 A few events to speak of, more training, lots more rain, and more time on the turbo! Feb for me was about carrying on training and slackening off a touch around 3 sporting TT’s, the idea was not to be 100% fresh for them but to treat them as half race half training. And I was doing turbo sessions with varying intensity usually the day before the events. It was a pretty cold day, and as per the year so far it was also pretty windy, I ran a disc and 90mm front wheel and within a couple of miles of the start I was regretting the deep front, I had to come out of the extensions at least twice to stable the bike when going by gaps in the hedge… I felt I was going OK, I got to the dual carriageway section and started to get a good rhythm going, but as with many sporting courses, nothing fast lasts long and true to form I was quickly faced with a 5 or so min climb out of Arundel! I could see my 2 min man ahead but wasn’t making much ground up the hill (he was quite thin!) as I chugged away. Over the top of the hill I was looking forward to the fast finish to drag my avg back up. It was not long however before all chances of pushing for the top were gone as me and the chap in front were held by a horse box who was stuck behind a rider and had caused a line of traffic behind, I had to slow and nearly came to a halt before the final ramp up before the finish. At this point my head was gone, I rolled in and myself and Chris (my min man) exchanged brief words about how annoying that hold up had been ( I later learned that there was a road closure nearby that was causing heavy traffic on the course) and went back to the HQ, I’d come in 4th by a few seconds to 3rd with 1st and 2nd place some way ahead. On a better day without the hold up I think I could go better on that course, but it truly is a bit hilly to ever really suit me I think. Next on the agenda among lots of turbo training due to the awful weather (thank god I live on a hill!) was the Kingston Wheelers Sporting 14. This has always been an event I wanted to ride and did enter last year, however, since 2011 where Steve Irwin took the honors, this event has not run due to ice, roadworks, and this year, almost, water!! The evening before the event the organizer had warned us that there were two patches of standing water on the course and that if you wanted to race, the race would be on, but these hazards were a reality. This put quite a few people off, and I think around a 3rd of the field chose not ride, which is fair enough. With signing on done, it would seem that without Wouter this could be my chance to get another win, and in a home event (after coming 2nd in club road race last year!). 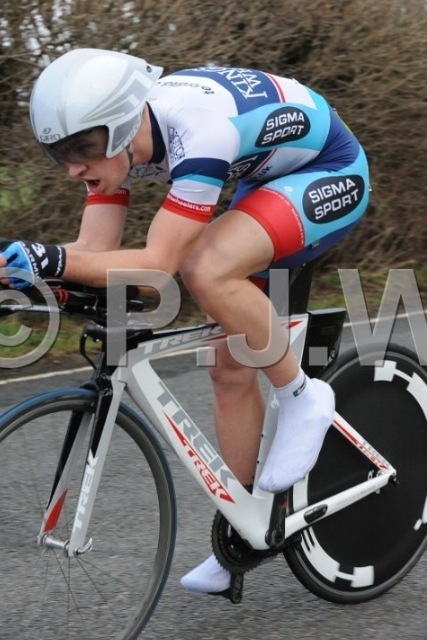 There were other good riders that I needed to beat first however : Tejvan Pettinger, hill climb extraordinaire who last year trounced the field again at our club (and nearly any other club event he entered) hill climb, and then won the nationals too. While he is a specialist in anything uphill, he’s also done a sub 50 min 25m TT.. And then a Liam from Twickenham who I race with fairly often and is a very handy tester, I knew these two would be at the sharp end. After my warm up I noticed I was the only idiot who decided it was OK to wear a skin-suit with aero mitts (it was cold and VERY Windy), and I also noticed that I was one of the few who were running a disc but with a shallow front wheel as it was blowing a gale and I thought it would be better not to go with the 90mm after Southdowns. I got off to a start and felt pretty good, I knew that I needed to be averaging over 25.5mph and nearer 26 to be in with a shot, by the time I’d done the drag and was hurtling towards the main hazard I was over 25 mph avg, so things were looking good. I knew the puddle was going to cover the road and that I might get wet feet…I saw it in the distance and came out of the extensions, and then, well, it was just a bit underwhelming, it was about 3cm deep if that. I saw pics after the event which made it much worse, but then I did go down the middle of the road (good line of sight) where I think it was shallower. Anyway, with that lap out of the way I was feeling confident, I chugged around another lap (lost my powermeter in the process as the crappy road made the magnet jump off and make a mess of my BB paint!!!) and this time hurtled through the water over 30 mph in the extensions, which again was fine and I wondered why I had not the first time! There was a brief fleeting moment where I thought the course record might be on the cards, but as always I massively under-judged how long the last stretch was, I came in at 31.27 (30.50 was Wouters CR), which I thought might well be enough to win. I got back to the HQ to find I’d managed to better Liams time by around 1.40 and also go 30 secs faster than Tejvan in order to take the win. A good race and a nice one to win. And lastly, the Redhill CC Sporting 18, I drove all the way there on what promised to be a chilly but glorious day. I got as far as the HQ carpark and was told to turn around as it had been cancelled due to ice. A marshall had slid his car driving out to his post, that was enough to prompt the orgs into cancellation, which was the right call. Two other riders from Redhill on regular club runs went down, broken arm, broken hip, broken vertebrae were all on the list, glad I didn’t ride. But do wonder when people will respect nature and leave it a little longer before they go out? Our club are the same and each time we hear of people going down when they could have waited an extra 90 mins and had a clear run. Couple of action shots from PJ Wright his site here – I will be purchasing said pics!